Story blurb: Out-and-regretting-it comprehensive attendee Jayden Phillips turns his cast-iron plans for life upside-down by falling in love with private-school violinist Darren Peace, a sardonic boy with the craziest hair Jayden’s ever seen. But all is not what it seems, and Jayden’s bullying problem becomes meaningless when he is confronted with what the music does to Darren. How do you stop a dangerous depression rooted in the same thing that makes someone what they are? Dark moods, blank apathy, and the undertow of self-loathing all simmer beneath Darren’s dry and beautiful veneer, and Jayden feels powerless to stop them. Then a mugging gone wrong takes the music forcibly away, and Jayden is finally given the chance to change Darren’s life — and, quite literally, his mind. About the aurthar: Matthew J. Metzger is an author of primarily gay romance novels, both adult and young adult. He is looking to branch out into mainstream fiction, other non-traditional sexualities, and fantasy. Matthew had two novels published in 2013, and so far has three contracted for 2014 release. He doesn’t even want to think about 2015. 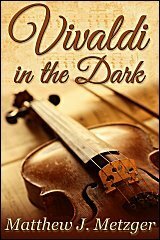 Although it has been longer than forever since I was a teenager, Vivaldi in the Dark (Vivaldi in the Dark #1) by Matthew J. Metzger [Queerteen Press, December 8, 2013] resurrected many memories of days gone by: the naïveté, the wonder, the uncertainty and the vulnerability, are all there, and the author has done a remarkably fine job of portraying them. Jayden Phillips is a quiet sixteen-year-old, sort or out [I rather disagree with the story blurb that suggests he’s “Out-and-regretting-it,” because he’s only truly out to his girl friend “Charley], and although bullied at the school he attends, he has a fairly realistic grasp on life. Darren Pearce is roughly the same age, living the life his middle-class parents have set for him—including becoming a virtuoso violinist—but to cover his unhappiness he has developed an outer shell of cavalier artificiality. However, along the lines of ‘opposites attract,’ each having negative and positive polarities, they meet and are immediately attracted to one another. Jayden is drawn to Darren’s swagger, and Darren is drawn to Jayden’s simple devotion. It is then that we start to see below the surface to discover that Darren is suffering from an undiagnosed form of depression. Nonetheless, Jayden’s devotion never waivers, and even though it is sometimes challenged by the ups-and-downs of depression and the ordinary vicissitudes of life and a relationships, together they persevere to a happy-for-now resolution. The basic structure of the plot is somewhat formulaic—boy meets boy in a coming-out scenario with complications—but what raises this particular story above the ordinary is the author’s apparent insight and sensitive exploration of youth-oriented depression that frequently goes undiagnosed and untreated. Since this story is also oriented toward young adult readers, it should serve as a positive resource beyond its entertainment value. Four bees.